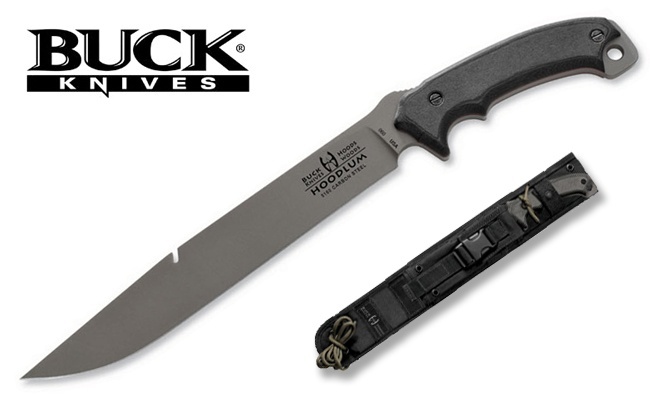 A few years ago I came across the TOPS produced Hoodlum Hell hound that was designed by the late Ron Hood, an American survival expert. I no longer have the original picture of the TOPS version but it would seem that Buck started producing the model and it looks pretty much the same so I'll put that picture here! Something about it really appealed to me. I decided to get a number of blanks laser cut and this is the design I used, very roughly basing it on the pictured knife. There are a few differences to note in my sketch versus the original - first off the original has a notch in the back of the blade. Apparently this is for lifting pots off a fire by hooking the bail. Not something that I have a big need for and it just looks like a weak spot to me! The internals on the tang is another difference, maybe I say maybe as I haven't seen the same spot on the production models. I would have put a big empty space there but there was mention in an article by Ron that the knife had a tuning fork inside that reduced handle vibration. My plan is to thin that bar a bit before handle fitting and it may possibly do the same. Dubious but no real harm either! Although not on my sketch, my plan for the scales is different to the original. I want the rear of the tang covered over and also don't think they need to go so far forward. Out of the four blanks I had cut, this is the only one I have done anything with yet. Safe to say, one of the remaining three will be a keeper for me. It was hard to give this one over!! The handle works really well for allowing chopping while hanging back on the handle or sliding it forward with the forefinger in the choil, feathersticks are a breeze. - Convex grind, more obtuse at the tip for chopping, thinner to the handle for finer work. - The handle consists of Carbon Fibre bolsters, Yellow Mallee Burl for the rest and stainless pins and tubing. - The leather sheath is dyed with dabbed pattern of brown and black dye, leaving some of the original leather colour exposed as well. The leather is treated with Ko Cho Line. The belt loop is on a dangler to allow movement on such a big sheath!